I’ve updated my granola recipe. The old one was good, but crunchy rather than crispy. Oil makes granola crispy and crunchy, so I’ve switched to a new recipe which has a little oil. This one is similar to Alton Brown’s, but with a few changes in ingredients and technique. I like my granola clumpy, and this technique guarantees a good deal of clumps. They key is covering the granola with foil to prevent over-browning and not stirring until the end, at which point you break it all up. There are lots of ways to package granola. For this batch, I used some little goodie bags from Michael’s craft store. And of course, you can always use the tin tie down bags from PaperMart. Pay close attention to bag sizes because they are all different. A fairly clumpy granola made with honey, maple syrup, coconut and nuts. Preheat the oven to 250 degrees F. Line two large rimmed cookie sheets (or roasting pans if that's all you've got) with parchment paper. If you are making half, you can use one cookie sheet. Don't try putting it all on one cookie sheet or it won't cook properly. In a large bowl, stir together the rolled oats, almonds, pecans, coconut and sunflower seeds. Toss in salt and stir to evenly disperse salt. Cover loosely with large pieces of foil. Bake for 1 hour, 1 pan on lower rack and one on upper. When you smell the granola (after about 40 minutes), check it to make sure it's not browning too much. If it's covered, it should be fine. Also, the granola on the lower rack will cook quickly, so after 40 minutes, swap racks. After 1 hour, remove the foil. Cook for another 15 minutes or until it is golden brown. Remove from oven and let cool completely. Granola will crisp as it cools, so don't worry if all of the granola doesn't seem crisp after 1 hour and 15 minutes. When cool, break the bigger clumps up into smaller clumps. Note: You may want to try this first with half a batch baked on middle rack of oven. When baking two pans, you run the risk of burning the pan on the bottom rack, so if you are doing two pans, watch bottom pan closely and swap spaces. I liked the old recipe a lot – is there a link to it?! I made this last night. To sum it up in one word. YUM! I did sub. the almonds for walnuts since that is what I had on hand and threw in some pumpkin seeds. YUM! I will be making this for many many years to come. Thanks! I made this recipe for my husband because store granola had partially hydrogenated oil in it. I used walnut oil in place of the vegetable oil because of the health benefits and added wheat bran. All I can say is DELICIOUS! My husband who is not a snacker said he would have a hard time not eating it at other times. Thank you for posting your recipe as I will be making this over and over again. Thanks so much for the compliment. I’ve been trying to improve my recipe writing skills, so I appreciate your remark about the directions. Hopefully the more recent recipes are even easier to understand. Also, thanks for including your coconut variation. I would have never thought to add coconut extract to granola, but it makes sense. I’ve made this several times now and tell everyone about it. My favorite variation is to use coconut extract in addition to or in place of the vanilla. Love your cooking directions. So easy. Thanks! Thanks for posting your review and including the changes you made. I haven’t been making (or eating) granola lately, but I’m sure I’ll start craving it again soon. I’m going to try this recipe with your suggestions. Thank you so much for the wonderful recipe! I’ve made several batches now, and it’s become a household staple. Actually, I made some for Christmas goodie bags, and several people have told me it’s the best they ever tasted. Kudos to you! I did play around with the recipe, and I’m happy with it. (I guess I can’t leave well enough alone….!) I used pecans, sesame seeds, sunflower seeds, and pumpkin seeds, but no almonds. I eliminated the coconut, and I’ve cut back the brown sugar by a tablespoon or two. Also, I’ve successfully upped the quantity of oats to 5-6 cups (sometimes using rye mixed in with the oats) and I’ve still got good clumping; not quite as much as the original recipe but quite sufficient, and this lowers the sugar ratio and so makes it a bit healthier. Great recipe – thank you so much. This one is a real keeper. Wow – thanks. This is the first time I found an answer to a question I had. I wonder what part of the process makes it clump? Heating the wet ingredients first, covering it or not stirring? Thanks so much for trying the recipe! If you like granola with a lot of flavor, another good one on this site is from Grace Parisi at Food & Wine. Here’s the link. I just thought I’d let you know in case you wanted to try one more ;). This was the best granola I’ve ever had! I tried a recipe from the food network, and it just didn’t clump up like yours did. Thank you for the wonderful recipe; it will be a staple in our household for many years to come! I too value clumpy granola. While granola as cereal or in yogurt is ok, I really want popcorn sized clumps so that I can eat it as a snack. Yum. People on my christmas food list are going to get a surprise this year. Last year I gave out toffee and truffles. This year it will be granola and either toffee OR truffles. We’ll see how that goes over. Have you tried Andy’s Fairfield Granola? Its so great and only uses 2tbls of oil. The recipe makes a huge amount too. Hi Anna, thanks for posting this. 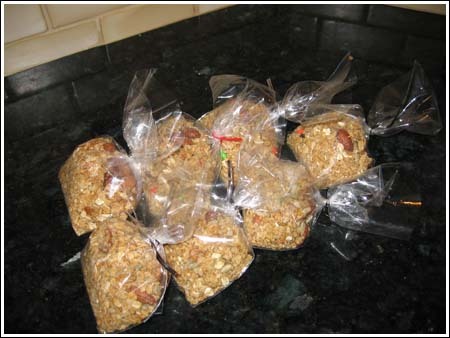 My husband loves your idea of giving his customers bags of granola with goodies like chocolate chips in them, so this is the recipe I will use. Can’t wait to try it.